It’s time to create fortress ABAX is the message from a “bitterly disappointed” Dave Robertson after his Posh side went down 2-0 at Rochdale on the opening day of the season. Robertson wants his side to respond well from the defeat as they get ready for three straight home matches, starting with Tuesday’s League Cup match against Crawley Town from the division below. The Posh boss admitted he was disappointed by his side’s first-half display at Spotland today (Saturday, August 8), although he refused to blame the loss on having to give two of his defenders their debuts, including Chelsea loanee Alex Davey who joined yesterday and has yet to train with his team-mates. Posh went down to goals either side of half-time from Callum Camps and Reuben Nobel-Lazarus. The latter’s strike came minutes after Joe Gormley had missed a great chance to level the score. Roberston said: “We spoke to the players, we had a good conversation in the changing room at half-time and they needed to raise their game. “Our engine levels were nowhere near good enough in the first-half. We needed to get closer and tighter to them in midfield, and when we did and when we got our full-backs higher up the pitch in the second-half, we caused some problems. “We created two really good chances - one for Joe Gormley when he got in behind and one for Jon Taylor. “We’ve created the chances we need to take, especially at places like Rochdale. On Gormley’s miss, Robertson said: “There are games within the game, there are key moments. And that was a key moment. “I felt we were on top and managed to get control of the game. We’d managed to deal with their midfield overload. Davey joined fellow defender Tobi Adebayo-Rowling (18) in making his debut. Robertson had praise for the performances of both players. Although Adebayo-Rowling inadvertently set up Rochdale’s opener, Roberston thought he equipped himself well and look good going forward. 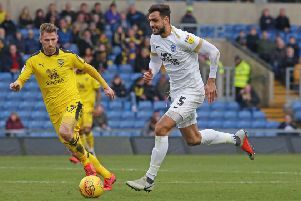 He was even more positive about Davey who has signed on a 30-day loan and who he admitted he might try to keep for longer, although he hopes to have Ricardo Santos and Michael Smith back for Tuesday, while Shaun Brisley is battling illness. Another player making his debut today was Jack Collison, albeit off the bench. Robertson said: “I think Jack Collison was excellent when he came on. I think he touched the ball more times than the other two midfielders in the 15 minutes he was on. Robertson said the only thing which might explain his side’s poor first-half performance was nerves in a young squad. But ever the optimist, he expects better things as his side make their first appearances at the ABAX in the new campaign. “It’s a disappointing opening day of the season, but we’ve got another 45 games,” added Robertson. “And we’ve spoken to the players and told them that we need to continue to improve and get better after every game.